Do you like Barbie Princess vs Tomboy? Share it with your friends. 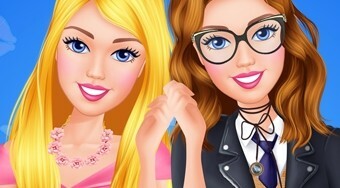 Barbie Princess vs Tomboy is a great girl game where popular beauty and fashion lovers Barbie has decided it's time to try something new in the trend of dress. Choose a haircut, clothes, and fashion accessories from two different styles, and then try to combine both of these styles together.